If you are a snob about fresh spinach, I encourage you to try this with frozen spinach. I actually think it’s better with the frozen because it is so dense: more spinach! Also, since you can keep frozen spinach on hand, this is easy to make when you want a quick dinner but can’t get to the grocery store. 1) Cook spinach in microwave, according to package directions (slightly less time than package calls for). 2) In large skillet, heat oil on medium heat and spread around the pan with a paper towel. 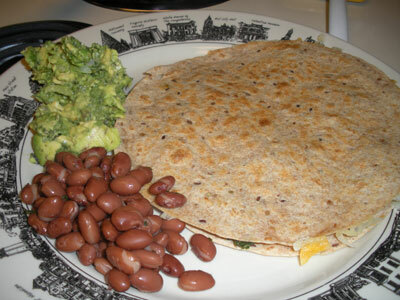 Place one tortilla in the pan and add cheese and spinach evenly around it. Top with second tortilla. 3) Grill about 5 minutes. Then flip and grill other side. 4) Serve with salsa on top. *Trader Joe's makes a bagged frozen spinach that is great to use here. Unlike the boxes of frozen spinach which I find I have to use all or nothing, with the bag, you can take out just as much as you need. Serves one person with a hearty appetite or two people with a light appetite. They can also be sliced into wedges and served as appetizers. Make as many as you need!